I have two special guests today. 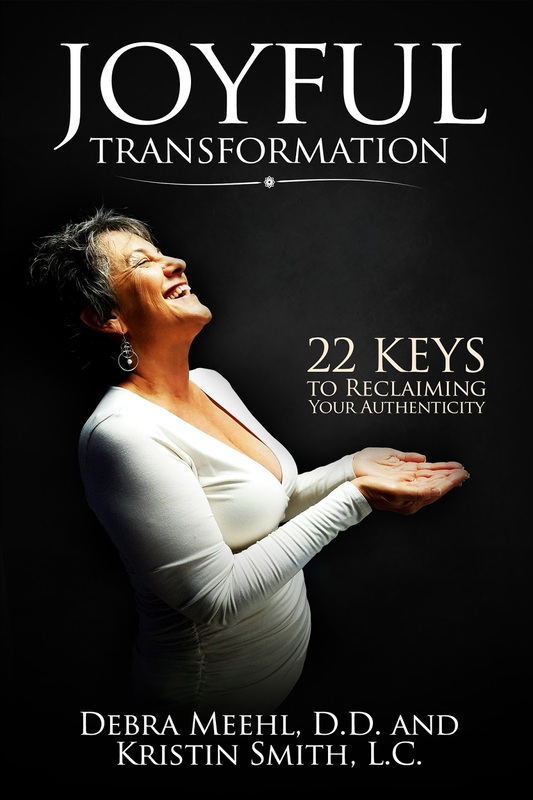 Co-authors Debra Meehl and Kristin Smith are joining me to chat about their self-help, personal growth book, Joyful Transformation – 22 Keys to Reclaiming Your Authenticity. Debra Meehl is a nationally recognized educator and author with a truly unique combination of credentials and life experiences that made her inexplicably qualified to establish and manage the Meehl Foundation. Among other things Debra is an interdenominational pastoral counselor with a Doctorate of Divinity, an intensively trained DBT skills trainer, an Amen certified brain health coach, and a board-certified hypnotist. As president and founder of the Meehl Foundation, Debra has worked extensively with clients from around the world; helping them surmount dogma, ego, expectation, irrational belief, and cyclic suffering in order to create a life worth living. Her uncommonly inclusive approach to counseling embraces personal belief and blends this with evidence based methods to create a customized course of action that is exclusive to the individual. For over 10 years Debra has dedicated herself to helping countless men and women heal the negative patterns and trauma of their lives and in so doing step into a life of authenticity and purpose. Kristin Smith is a Certified Professional Life Coach with a uniquely holistic practice. Using the Amen approach to brain health in conjunction with a multifaceted coaching method, Kristin provides practical insight and pragmatic suggestions to guide clients toward a physically, mentally, emotionally, and spiritually fulfilling life. Her distinctive approach to coaching blends personal spirituality with evidence based methods to encourage a life that is holistically satisfying. Kristin has worked extensively with non-profit organizations, using this approach as a guide to help others creatively embrace the lifestyle they desire. For over five years, she has dedicated herself to helping dozens of men, women, and children break free of the patterns stifling their potential and in so doing discover, design, and seize the life they really want. Kristin is a member of The Meehl Foundation’s intensively trained DBT treatment team, and a frequent contributor to their blog, and coauthored Joyful Transformation to supplement her unique coaching method. She completed training as a DBT skills trainer with Behavioral Tech™, studied yoga and meditation with acclaimed neuroscientist and author C. Alexander Simpkins (Ph.D.), and received interfaith ordination on June 26, 2015. Welcome, ladies. Please tell us about your current release. (Debra) Many of us spend our entire lives running from feeling, believing that we cannot bear the pain or shame or suffering we encounter. But the immortal diamond at your core is only refined through the heat and pressure of both pain and pleasure. Joyful Transformation is about practical skills (like distress tolerance and emotion regulation) you can use in everyday life to help you move through the pain; fully experience the pleasure; connect and unite with, heal and embrace your true self; and thereby create a life that is truly worth living. (Kris) Joyful Transformation was designed to be a road map for people seeking a way out of mediocrity and misery; a blueprint they can follow to systematically build a better life. Emptiness and disillusionment have become common and familiar companions in so many lives. Our society has created a culture-scape wherein asking for anything more or seeking to lead a truly fulfilling life is viewed as foolish or outright selfish. For decades now millions of people have silently and unwittingly accepted this unwritten obligation to lead an unfulfilling life; the life that is expected of them. But it doesn’t have to be that way. We were all meant to live a life of passion, creativity, and joy. And no matter the obstacles, I really do believe that everyone is divinely equipped to achieve this kind of lifestyle. Joyful Transformation was designed to tackle the social gag-order on suffering, candidly examine how it has shaped our lives and our beliefs, and provide a way to change all of that one simple step at a time so that we – as a whole culture, one person at a time – can achieve conscious, measurable, lasting change that improves quality of life, reduces the burdens we carry (willingly or otherwise), and frees us to live the best life we can - a life worth living. (Debra) The concept for Joyful Transformation was birthed out of my own life experience, both with my family (which is touched on in the book) and further in my founding of and work at the Meehl Foundation. (Kris) When I started working at the Meehl Foundation, I had already worked in the mental health field for three years and was extremely disillusioned with the whole experience. I couldn’t figure out what was missing, but I knew that what I’d seen just wasn’t working… and it wasn’t just in treatment centers. I saw this yawning, glaring gap everywhere in life. We all seemed to be doing the very best we can, doing everything right, and still somehow missing the mark by a mile. It wasn’t until I learned about DBT (dialectical behavior therapy) and the “skills” it teaches that I realized, no one ever taught me how to actually live this life. We learn reading, writing, arithmetic… we, as a society at large, never learn how to process emotions, cope with stress, or handle interpersonal relationships with personal integrity. Sure a few kids get lucky, but by and large the most important skills we ever learn are never actually taught. And they ARE teachable skills. DBT showed me that. But it’s very treatment specific. And I knew that very few “normal people would ever pick up a DBT skills book, even if it would change their lives… and I whole-heartedly believed it would. So, I sat down with Debra and in a matter of hours the concept for Joyful Transformation was born. (Debra) While it’s not a story, per se, we are currently in the process of organizing luxury retreats, wherein readers – or anyone interested, for that matter – can enjoy an exclusive three-day weekend including personal coaching with Kristin and myself to apply the concepts and master a lifestyle of Joyful Transformation. Details are on our website. (Kris) Well, we have a few big and exciting things in the works. First, we’re working on this idea of hosting Joyful Transformation retreats, where people can come stay at the retreat center over the weekend and spend personal time with Deb and I, learning how to apply the concepts in the book and really step into their authenticity, connect with their personal values and beliefs, identify what’s holding them back, and lay the foundation for really mastering a lifestyle that’s in line with what they really, truly want out of life. And then, we also have a second book concept that kind of in its infancy. Joyful Transformation is a really great, really basic kind of field-guide for life. But I really want to delve more into the spiritual aspect of our lives and of the human psyche. Because our spiritual selves (whatever that looks like for you) are so integral to really leading a fulifilled life, and so much of that is either over looked or dogmatized to death. So we’re working on a concept (working title: Spiritual Transformation) that ties the spiritual together with this physical life to kind of move people into the next phase of truly joyful living. (Debra) To be honest, I have never considered myself a writer. My goal was to produce something that would help others reach their goals and dreams, and fully realize their potential in life. Writing just happened to be the medium through which I can do so for the largest possible audience. (Kris) I guess I’ve always considered myself a writer in some respects. Throughout my career-life it’s always been in the background in one way or another – grant writing, publicity, research papers, treatment plans… in a more corporate/professional sense. I blog regularly for the Meehl Foundation and on several spirituality-focused sites. I dabbled in playwriting and fiction in college, and for most of my life before that. Storytelling has always been an integral and vital part of the way I communicate. It’s like part of my soul, as silly as that sounds. So transitioning into this world of “being an author” was really just kind of a natural progression for me. (Debra) No. Most of my work is centered around operating the Meehl Foundation. A typical day involves a lot of managerial and administrative work, with a hefty dash of coaching and coordinating services. Writing is usually haphazardly smashed somewhere in my free time, right between grandkids and fireside reading. I fit it in where I can, when I can. And just do the best I can, which is all anyone can really aim for. (Kris) No. Not by a long shot. I try to fit it in as much as possible, especially when inspiration strikes. But between coaching and managing the Meehl house, my work day is pretty full. There’s yoga in the morning with clients, meal prep during the day, blogging and publicity for the book, coaching in the afternoon/evening, plus shopping, coordinating treatment, entertainment, and transportation, and then some semblance of a personal life… and writing just kind of falls in there in between all of that. It’s kind of the thread that weaves all the fibers of my life together; the weft to my warp. (Debra) I read along to myself as I’m writing. And as I’m reading, I have a bad habit of putting a comma anywhere that I pause to take a breath - in any sentence, regardless of proper grammar. My editor hates it. (Kris) I have this one song that I play when I’m writing: River Flows in You by Yiruma. I don’t know why, but it really helps me focus. I just put it on in the background or put my headphones on and let it play… over and over and over… until I’m done with whatever section I was struggling with. I think I’ve easily looped it six-million times in the course of publishing this book. (Debra) You know, John Lennon was asked the same question in school. His answer was, “Happy”. And I think more than anything else “Happy” is exactly what I’ve always wanted to be. (Kris) I think more than anything I wanted to be someone to help heal others. For a long time it was a pediatrician, then a missionary, then a teacher, then an herbalist (which I still study academically) and eventually I came to this epiphany that all of that boiled down to one really simple basic idea… I just want to help people. And so that’s what I started doing. (Debra) Initial consultation is free when you book a coaching session through the Meehl Foundation. Please follow us on Facebook to learn more about our upcoming retreats. And feel free to reach out or interact. We always love to hear from our followers. (Kris) Just that I’d love to hear from them. They can find me on Facebook, or the Meehl Foundation website. I’m super approachable and always excited to help or just listen. Initial consultation is free if they want to book a coaching session, otherwise I’m always tickled pink to have someone drop a like or comment on one of our pages.